snowdeal.org > ex machina: (mostly) organic comfort food. or mmmmm, doughnuts! (mostly) organic comfort food. or mmmmm, doughnuts! hoooey, i am going to be everyone's best friend at work tomorrow. 1. Dissolve yeast in warm water in a large bowl; let stand 5 minutes. 2. Add buttermilk, lard, sugar and 1 1/2 cup flour, baking powder and salt; mix well. 3. Add enough remaining flour to make a soft dough. 4. Turn dough onto a floured surface and knead several times. 5. Roll dough to 1/2 inch thick and cut with a 2 1/2 inch doughnut cutter. 6. Place doughnuts on lightly floured surface, cover and let rise 45 minutes or until double in bulk. 7. Heat 2-3 inches of oil to 375°F. 8. Drop in 4 or 5 doughnuts at a time. 9. Cook about 2 minutes or until lightly golden in color, turning once. 10. Drain well on paper towels. 11. Combine 2 1/2 cups powdered sugar with 1/4 cup milk, stir until smooth. 12. 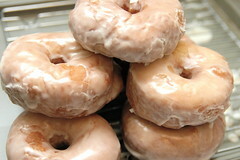 Dip each doughnut in glaze while still warm; allow excess glaze to drip off. 13. Cool on wire rack or serve warm. I can feel my arteries slamming shut just looking at the pictures, but what a way to go!